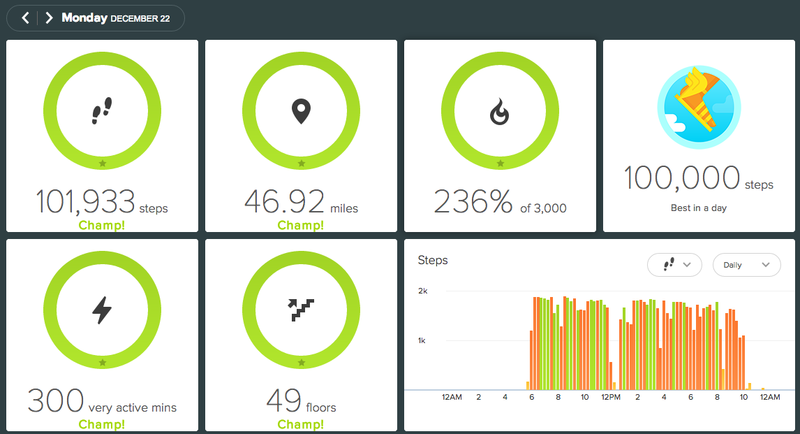 Last week, I introduced a crazy and audacious goal, of knocking out 100,000 steps (as measured by Fitbit), in the name of personal achievement and to raise money for Camp Taylor, a summer camp for children with heart disease, in honor of colleague Ken Norton's son, Riley. And I'm beyond happy to say our adventure was a success. As chronicled on all the social channels (Twitter, Facebook and Google+ for starters), +Stephen Mack and I passed the 100,000 mark shortly before 10 pm Monday night, after 16 hours of pavement pounding fun that covered more than 46 miles - seeing us start before dawn, and keep pressing forward until daylight was a distant memory. And better yet, our efforts were not in vain as many of you were eager to support us through nearly $5,000 in donations to Camp Taylor, beating our target of $4,500. 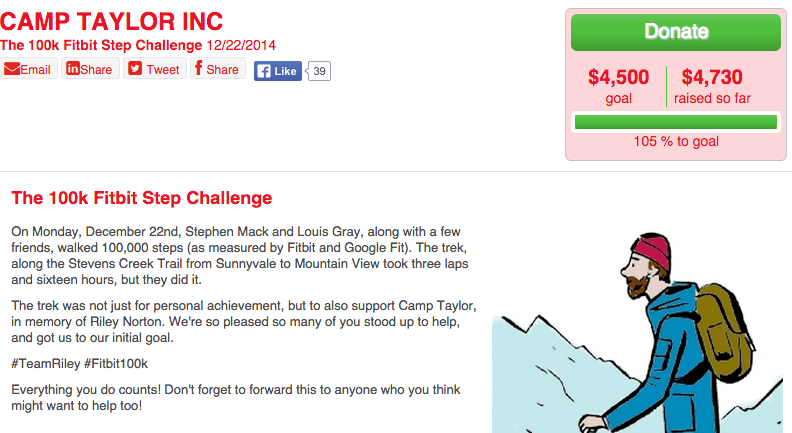 Our fundraising goal for Camp Taylor: Achieved! 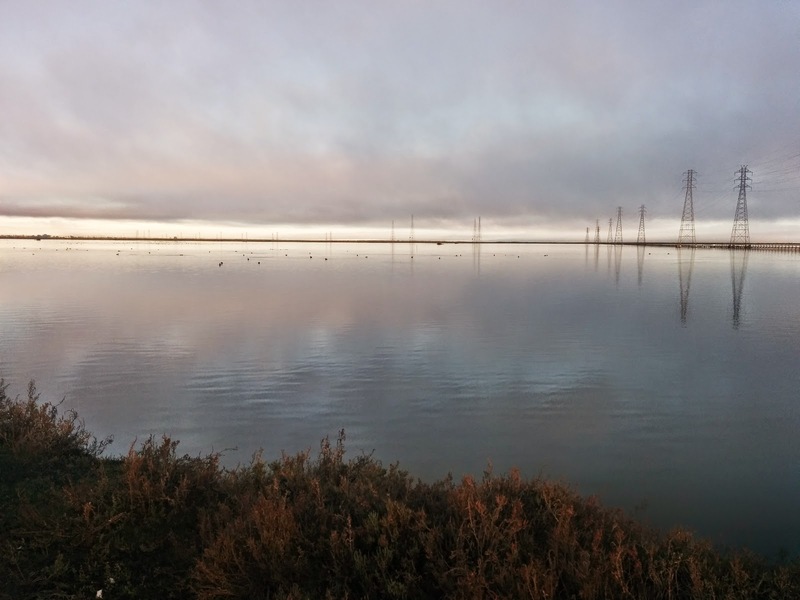 As I set out in our planning, Stephen and I got nearly all our walking in through three trips along the Stevens Creek Trail, which connects Sunnyvale to the San Francisco Bay through Mountain View, just past the Google campus. We grabbed backpacks with essential snacks and fluids, multiple phone chargers for guaranteed power, and thought ahead - bringing bandaids and Advil for inevitable pain, and head-mounted lamps to break through darkness. 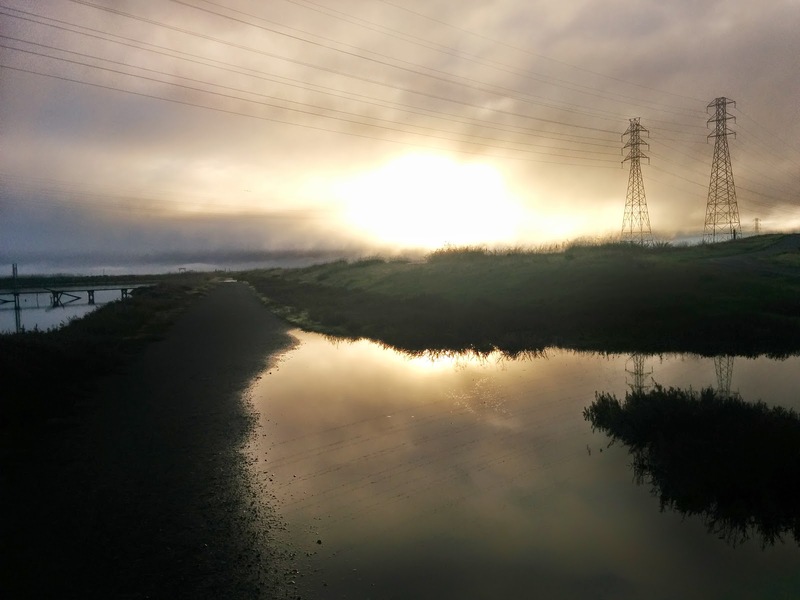 Some scenes from early morning Monday, before the pain. Our initial pace was quick, as I'm accustomed, and Stephen did a solid job adjusting, as we maintained strides through most of the day, even beyond the 10, 20 and 30 mile marks. And we were lucky enough to be joined for much of the journey by friends, each of whom did a lap with us, meaning we were marching in a group of three for about 80 percent of our trek, sharing new pains, stories and sights with one another. 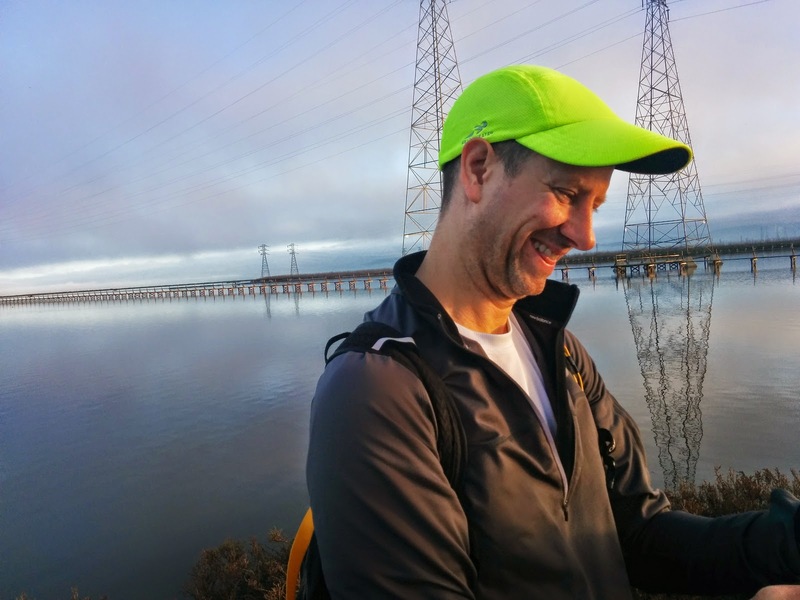 Having walked greater than 50,000 steps a few times myself, I knew I could hit the 100k as a stretch goal, so long as life didn't get in the way, but as our mark neared, I absolutely felt the fatigues and aches that threatened to make finishing difficult. We were each battling aches in practically every part below our waist, and our feet were a mess of blisters and soreness that wouldn't be solved until we were done. By the 92,000 mark, just an hour and a half away from the proverbial finish line, I was nearly overcome with dizziness and a slight spell where I was a bit concerned I'd pass out and fall short. 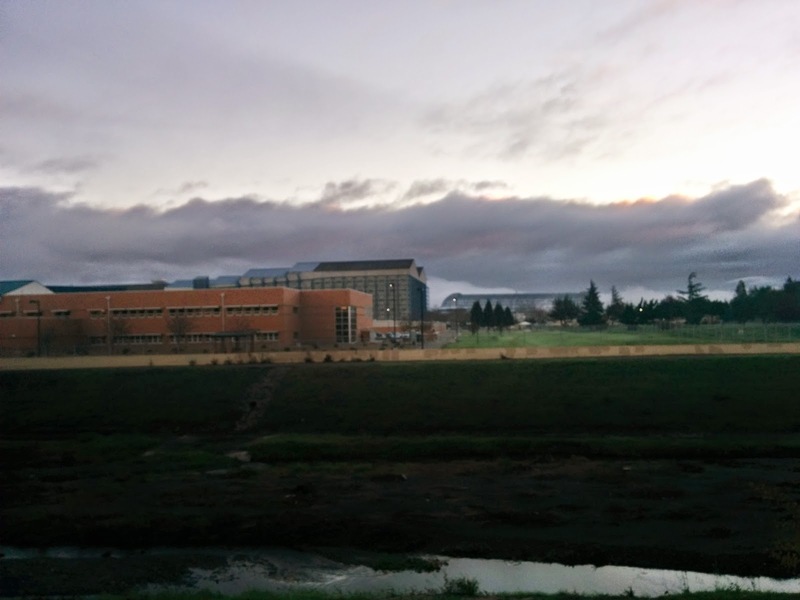 Whether I was dehydrated or had just hit a wall, I'm not sure, but with water and about 10 minutes rest, we were able to continue marching, and eventually things settled back to where they were at a good rhythm through the end. 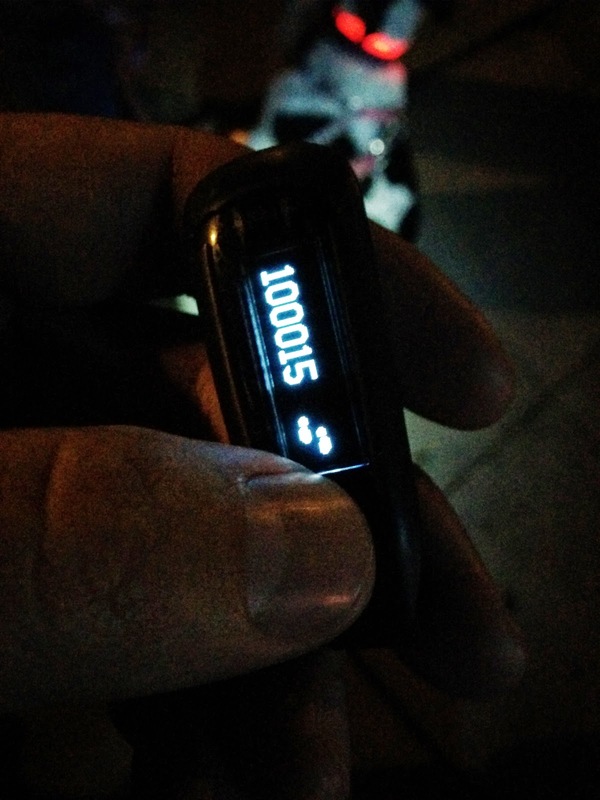 Hitting 100,000 Fitbit steps just before 10 p.m. Monday night. As my math had planned, we made it back to my house the final time with 99,000 steps complete. We dropped off our heavy bags, and took one last victory lap around the block, reaching 100,000 steps at 9:52 p.m., after a momentary scare that Fitbit couldn't handle six digits and our walk would have been mocked at the very end. My tracker had stuck at 99,999 steps and then jolted forward to 100,007, so no pictures of perfection exist, but we had done it. We wearily high fived one another and then trudged home to call the event a success. As I told Ken, I promised I would do the full 100,000 steps, and we had done it. Our promise to Camp Taylor, and those supporting us with their donations, or words of encouragement in the streams, was that we would make our full effort, despite fatigue or soreness. And of course, our momentary strains that are nearly gone a few days later are nothing like the prospect of heart disease the youth we were walking for live with each day. So we had pressed on. Tuesday and Wednesday saw little walking at all, as you can imagine. 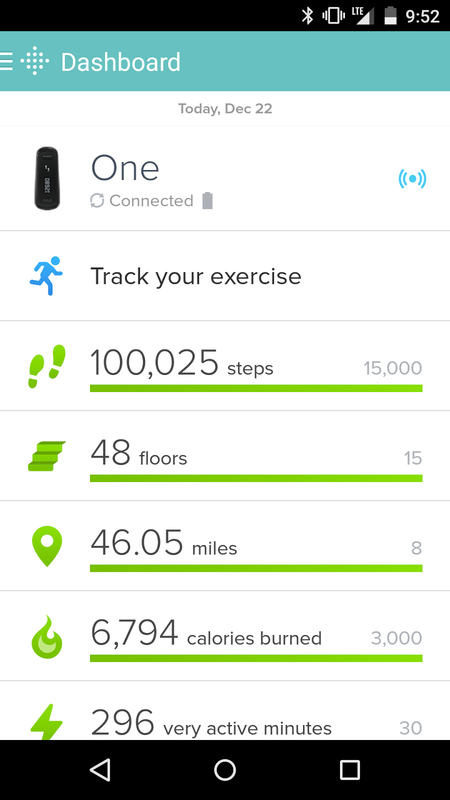 I completed the Christmas shopping Tuesday and walked around a bit Wednesday, but didn't even crack 10,000 on Fitbit. I hope you'll understand. But I wanted to thank Stephen, and his sister Joanna, our friends Roger and Ken for walking with us, and the more than fifty people who donated to Camp Taylor and really had our back. What we did was hard and fun, and it was made easier with a real and virtual team. This is the experience I'll most remember from this year's Christmas season.